In a cataclysm of weirdness, The Darkness have been chosen by Lady Gaga as the main support for the pop star's 2012 Born This Way Ball European tour dates. The Lowestoft group will be joining Gaga throughout August, September and October for the Euro leg of her Born This Way Ball tour, which kicks off on 14 August in Sofia, Bulgaria. The tour also includes massive shows with the singer in London (Twickenham, 8 September) and Manchester (MEN Arena, 11 September), which will represent some of the band's biggest gigs to date. 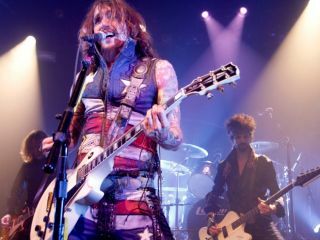 Following the announcement, frontman Justin Hawkins tweeted: "Been living with this @ladygaga secret for a while now. It hasn't felt real until this morning. Now I'm even more excited!" The Darkness kicked up a storm in the US early this year after Hawkins starred in Samsung's Galaxy Note advert (embedded below), which was first aired during February's Super Bowl. Although it's one of the stranger pairings we've seen in recent years, the two acts both share a love of revealing flesh, theatrical live shows and outlandish stage wear. Lady Gaga's last world jaunt, The Monster Ball Tour, was one of the highest grossing concert runs of all time, bringing in an estimated £143 million and performing to a total of 2.5 million fans.